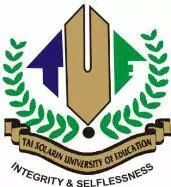 TASUED 9th Convocation Ceremony for the conferment of Honorary Degree, Award of Bachelor’s Degree, Postgraduate Diploma in Education, Higher Degree and Presentation of Prizes. State Professor. Oluyemisi Ogunlade unbehalf of the Governing Council and the Senate cordially invites the general public especially graduands to the 9th Convocation Ceremony for the conferment of Honorary Degree, Award of Bachelor’s Degree, Postgraduate Diploma in Education, Higher Degree and Presentation of Prizes. TASUED 9th CONVOCATION CEREMONY PROGRAMME OF EVENTS. Description : Football matches between male and female students of the University. Facilitating Unit: Vice Chancellor’s office, CENVOS, Creative Arts, Home Economics and Technical Education. Description : Showcasing the University through it’s Entrepreneurship and other products. Goal : To let the community see the university’s entrepreneurship and other products first hand. That is all the necessary information you need to know about the upcoming TASUED 9th Convocation Ceremony 2017.